BUENOS AIRES HABITAT offers temporary rent of fully furnished apartments in Buenos Aires and distinctive real estate for sale. Whether you are traveling for a 3-day holiday or relocating in Buenos Aires, we can assist you with all of your real estate needs in Buenos Aires. Apartments are located in the best locations: Recoleta, Palermo, Plaza San Martin, Puerto Madero and more! We think our personal approach to service is the key to our success. Our staff provides fast, friendly one-on-one personalized service. We help you every step of the way, whether you're searching to buy Buenos Aires real estate or rent Buenos Aires apartments. BA Habitat features an exclusive selection of Buenos Aires properties. Select from our collection of luxury Buenos Aires penthouses, high-end lofts, distinctive houses, or modern studios. Enjoy the convenience and personal service you only get from Buenos Aires Habitat. 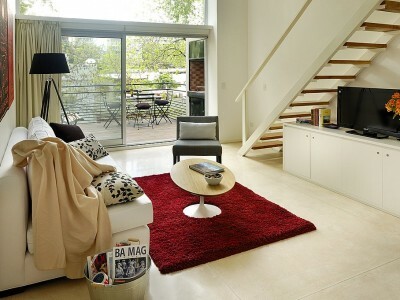 Buenos Aires vacation rentals are an appealing and cost-effective alternative to stay in a Buenos Aires hotel. Our luxury apartments in Buenos Aires provide the ultimate combination of home-style living and the comfort of a hotel. Plus you will save money; Buenos Aires apartment rentals can equate to a 50% saving on Buenos Aires hotels of equivalent standard. We personally search for Buenos Aires flats, townhomes, condos and lofts that meet our high standard needs. Our Buenos Aires homes are very unique, warm, comfortable, and cozy fitted out with modern amenities: kitchenware, telephone, linen and towels, microwave, cable TV, and internet access. Looking to invest in Buenos Aires Real Estate market? We have developed a comprehensive one-stop guide to buying properties in Buenos Aires. Click here to check our Buenos Aires Real Estate: Buyer’s Guide to learn more about the real estate buying process in Buenos Aires. Buenos Aires Real Estate Services - We offer Real Estate Consultation and Property Finder Services that will help you find the perfect property and save you valuable time and money. Through our experience and network of contacts, clients have access to the best properties available on the market that will perfectly match their requirements, without having to book appointments with several different Buenos Aires real estate brokers. As a full service Argentine real estate firm we can help you get the best deals on Buenos Aires apartments for rent and real estate for sale. Premium Buenos Aires Real Estate Palermo Hollywood: Ravignani St. & Nicaragua St.